1) You answer a customer's question and/or request. 2) The customer gives you a positive rating. A positive rating is defined as three stars or higher. 3) Credit for the value of the question, any bonus, or any applicable Premium Service is applied to your JustAnswer Expert account. - Visit the Request Payment page by clicking the "Current Earnings on Account" link located on the My Account page. - Specify whether you would like to transfer all, none, or a specific amount of your earnings from your JustAnswer Expert account to your PayPal account, specify your PayPal email address, and click "Submit." The payment schedule that you configure will automatically be used for future months and you will be eligible to have earnings paid out as long as your earnings are at least $20 at the end of each month. Make sure to make any changes before 12:00am UTC on the first day of the month – missing this deadline may cause your payment to be delayed until the next cycle. 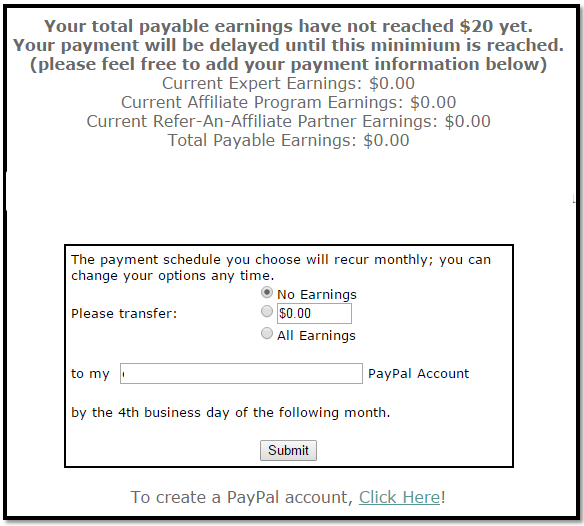 5) Experts Will Need to set up a PayPal Account and collect their payouts from their PayPal accounts. Expert payments are processed directly to your PayPal account within the first four (4) business days of the following month. 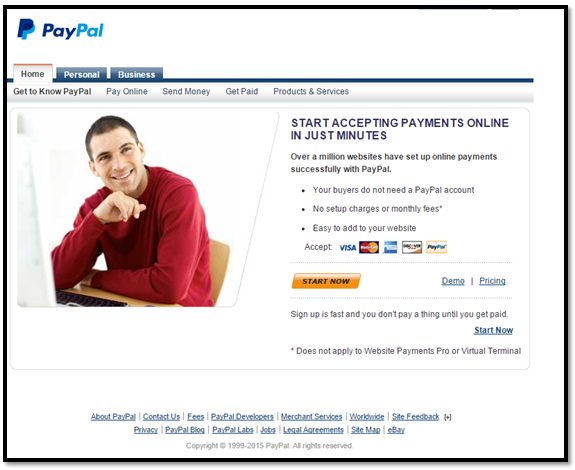 To set up a PayPal account, follow the directions on PayPal's website and be sure to use the same email address that you used in your JustAnswer Payout schedule. VERY IMPORTANT: It is your responsibility to check your PayPal email address before JustAnswer issues payments. Any change to pay requests must be completed before 12:00am UTC the first day of each month. Absent error by JustAnswer, we reserve the right to correct erroneous payments in the next month and not before. No payments may be issued outside of regular payment cycles. Refunds: If a customer requests a refund within 30 days of payment, Justanswer will honor the customer's refund request. Justanswer also reserves the right to process refunds requested after 30 days. The customer's payment to you will be drawn from your earnings and returned to the customer at the time that the refund is issued. Q: This is great, except I'm unclear on Refunds. Here's what you wrote -- can you elaborate on this? The customer's payment to you ///will be drawn from your earnings/// and returned to the customer at the time that the refund is issued." For example, What are the policies, duties & responsibilities of the Expert at that time (and after), with regard to returning payments? AND what happens if an Expert has zero-dollar earnings in their JA account at the time the refund to customer is issued? "Refunds: If a customer requests a refund within 30 days of payment, Justanswer.com will honor the customer's refund request. Justanswer.com also reserves the right to process refunds requested after 30 days. The customer's payment to you will be drawn from your earnings and returned to the customer at the time that the refund is issued." Hi @silentashes, I am passing your questions to our Expert mods to better answer. I don't use PayPal any more is there a different way of being paid? @msbabyd: Hi there. I've passed your question along to Lori and Maria, our Expert Moderators, who will get back to you ASAP. What about negative rating from customer without mentioning any reason for that ? and timed out requests which were not rated ? Hi Aladdin! Currently, negative ratings do not affect Experts. If you get a negative rating, use it as an indicator to follow up with the customer. If you get a timed out request and the customer has expressed satisifaction with your service, you can submit a no-click-rating request by clicking on the Submit a ticket button at the top of thjis page. Our Expert Moderators will review your request and if approved, you will be credited. What is the procedure if you provide an answer (or multiple answers) to a customer and they will not rate you. Are those just questions you will not be reimbursed for? Hi Olivia, we send customers several follow-ups on your behalf to remind them to rate. If you have a customer that was clearly satisfy with your answer but did not rate, you can submit a No-Click-Rating (NCR) request and the Expert Mods will review. To do so, just click on the "Submit a ticket" button at the top of this page. Make sure you include the question URL with your NCR request. I am noticing more and more that customers elect not to rate the expert, becoming abusive of the service. Is there anything that can be done with customers that repeatedly request responses, receive them, or even request a specific expert get a response but never rates the response? Is there a way to stop this as it is becoming a regular theme amongst a lot of the customers. Hi Tarra, we do want to make sure that Experts are fairly compensated. We are reviewing the payout structure and will inform the community if we make any changes. In the meantime, we do send customers multiple notifications to rate and have processes in place, such as No-Click-Rating (NCR) requests, that help with rating. Can we implement a reminder when they try to exit the chat window to rate to compensate the expert that helped them since they have paid for the service? Hi Stefan, we already do send customers several reminders to come back and rate the Expert if they have not done so. The first reminder goes out 24 hours after an answer has been provided. 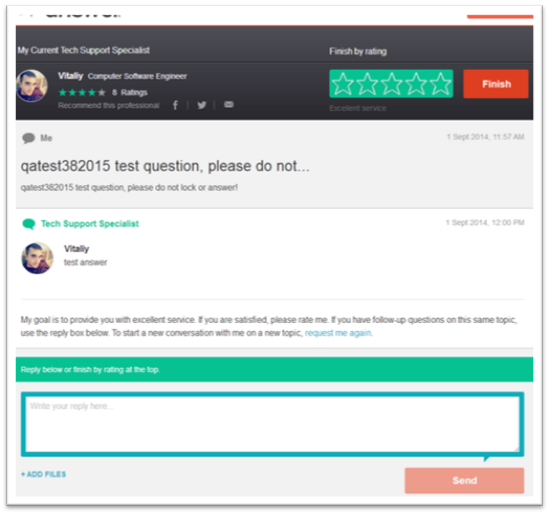 "... a reminder **when they try to exit the chat window**"
If reminders are sent to customers reminding them to rate the expert, then wouldn't their lack of response or rating be a conscious and deliberate act to avoid compensating the expert? Often experts send a message in their response to customers to please rate the response but this often goes ignored. Many continue to ask multiple questions as if unaware the request to rate has even been made by the expert. However, they will remind an expert if they do not feel one of their questions was thoroughly answered, to elaborate. Therefore, I do not think providing the customers with reminders is the real issue. @tduford- I disagree; I think many non-tech-savvy folks miss seeing the emails in their inbox... or simply don't open them because they think, "oh well it's fixed, so i can ignore that now" -- not necessarily realizing that it's important for the expert to be paid! .... an in-browser popup window is easier to see than an email. and there have been bugs/issues in the past where folks' responses aren't sent properly via email. Can I just use my personal paypal account or do I need a business one for this? @henrysdoc Yes, you can use your personal PayPal account.